I wish you all a Happy New Year—create and be prosperous. I’m in Florida at the moment, trying to catch up on organizing my databases, going through photos to make room on my external hard drives... You know the new year cleansing! Will talk about clearing and cleansing later... For now let’s get back to business after a couple of weeks off for the holidays! 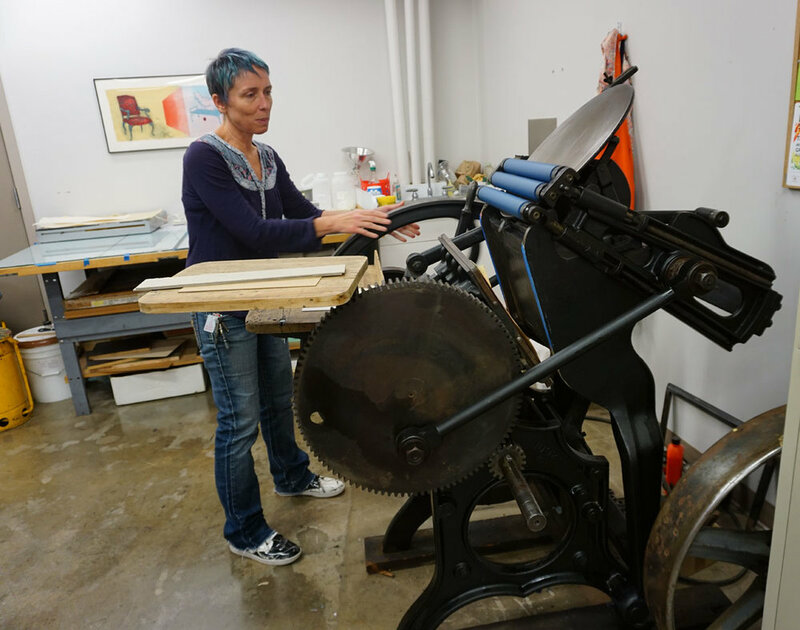 Last Fall while in Texas, I visited Flatbed Press with Mary Braughman from Austin Book Arts Center. © Louise Levergneux. I enjoyed the four legged creates of Texas. Flatbed is located on Boggy Creek, near the University of Texas. This Spring, Flatbed will be moving to 3701 Drossett Drive in Austin. 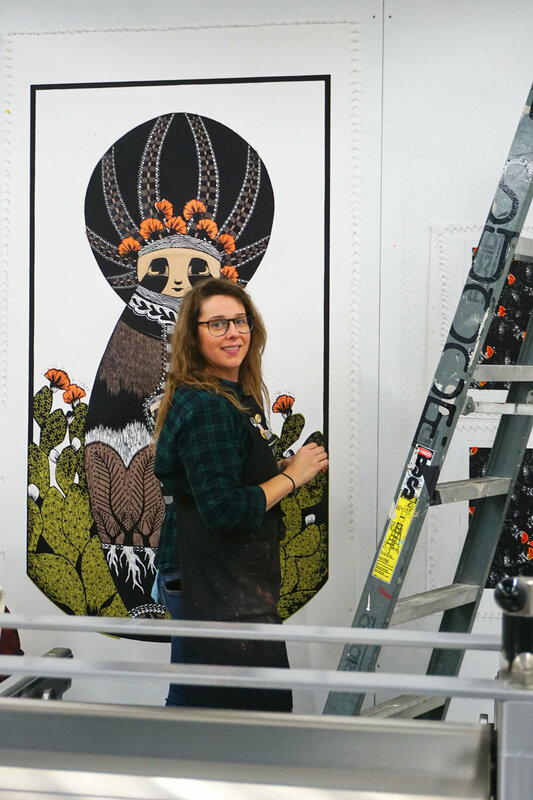 Flatbed is comprised of two divisions, the Flatbed Press, a publishing workshop collaborating with artists to produce limited editions of original etchings, lithographs, woodcuts and monoprints. And the second division is Flatbed Gallery—a private art gallery, which specializes in original prints. I had the privilege of meeting Annalise Natasha Gratovich who was working diligently on her own new series, her largest series to date. The Villagers, Carrying Things From Home, is co-published by Flatbed Press. The remarkable series includes eight 3 x 5.5 foot hand-dyed chine collé woodcuts. © Louise Levergneux. Annalise Natasha Gratovich working on her new series, The Villagers, Carrying Things From Home. © Louise Levergneux. © Louise Levergneux. Annalise Natasha Gratovich at Flatbed Press. So, what does “chine collé woodcuts” mean, you ask? Chine-collé roughly translates from French as “chine” meaning tissue, and “collé” is glue or paste. The paper, usually in pre-cut shapes, is actually bonded to the heavier support paper of the print in the printmaking process. The over-all effect of collé is that the paper is actually bonded, not just glued, to the print. It can, at times, look like it is embossed. The word chine was adopted because the thin paper traditionally used was imported into Europe from China, India and Japan. One of the commonly applied techniques includes dampening the thin paper and placing it on the inked plate. What makes collé different from collage is that it is then run through a printing press where the pressure of the press adheres and bonds the collé paper to the print. This process is how Annalise applies the colour to her work and she carefully hand dyes the coloured papers. © Louise Levergneux. Annalise Natasha Gratovich’s chine collé woodcuts drying at Flatbed Press. © 2018 Annalise Natasha Gratovich. The Builder, part of The Villagers, Carrying Things From Home by Annalise Natasha Gratovich. © 2018 Annalise Natasha Gratovich. The Musician, part of The Villagers, Carrying Things From Home by Annalise Natasha Gratovich. Gratovich is the Associate Gallery Director of the fine art print publisher Flatbed Press and a member of the Board of Directors of PrintAustin, a month-long, city-wide printmaking event for which she has helped organize exhibitions and special events, curate the PrintAustin Invitational, and has participated in artist and curator talks, and panel discussions. © 2018 Annalise Natasha Gratovich. To Awaken In Paradise an etching with hand dyed chine collé by Annalise Natasha Gratovich. I’m around the Tampa area of Florida for the next 3 weeks, then I’m visiting The Florida Atlantic University Wimberly Library and the Jaffe Collection at the end of January in Boca Raton. If you are interested in a visit to your studio, please, let me know. I would love to be introduced to your artists’ books. There is a considerable amount of art to see and visit in Austin, Texas. 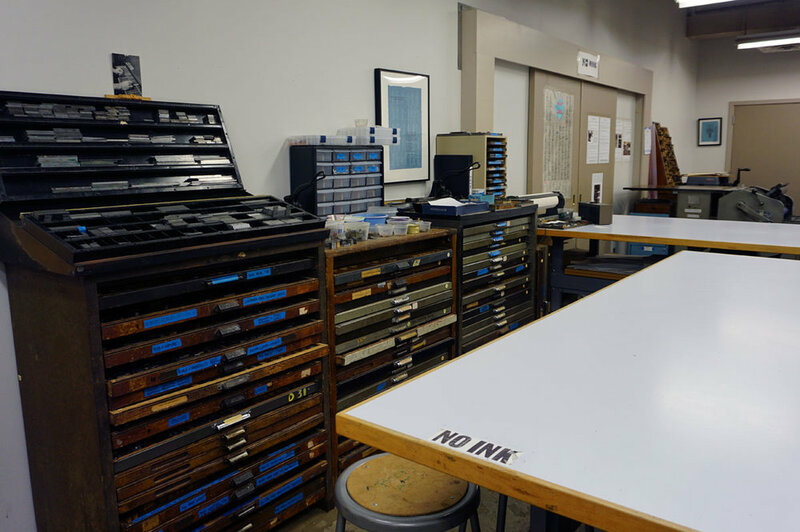 A few weeks ago I was at the Austin Book Arts Center located in studio #114 in Flatbed Press building. While I was meeting with Linda Anderson, Mary Baughman stopped by to say hello. We met last year, when she created introduction opportunities to other artists in the area. © 2018 Linda Anderson. Michael Sutton, Louise Levergneux, Mary Baughman, outside the Austin Book Art Center, Austin, Texas. Mary’s career spanned 40 years at the University of Texas, most of that time caring for unique books at the Ransom Center. Teaching book arts for children has convinced her that children who learn to love books continue to treasure reading and writing, and will support the libraries of the future. Mary is additionally a associate of the Lone Star chapter of the Guild of Book Workers, a founding member of Austin Book Workers, and one of the originators of the Book Arts Fair held for 20+ years at Laguna Gloria Art Museum. If you are a conservator you might be interested in reading on how Mary spearheaded the effort at the Ransom Center by creating insect ID flashcards. After my time with Linda, Mary accompanied me around Flatbeb Press, founded in 1989 by Katherine Brimberry and Mark L. Smith. The facility includes not only Flatbeb’s shop, offices, and galleries, but also eleven tenants. The mix of visual-arts professionals provides a "24/7" creative synergy in the building. Jacqueline May Studio and Troy Brauntuch Studio. © 2018 Louise Levergneux. Ericka Walker, exhibition of lithographs and screen prints. While walking around the galleries, I witnessed Influence an exhibition of recent works by Nova Scotia based artist Ericka Walker, who was born in Hartford, Wisconsin, US. Her large-scale multi-color lithographs draw on the vibrant history of propaganda, printed ephemera, and advertising from twentieth century Europe and North America. Ericka's work exposes nostalgia as an ongoing rhetorical device in a contemporary sociopolitical climate that clings savagely to destructive birthrights and colonial residues. As a self described “Daughter of Colonialism,” Walker considers the history of her parent nation, her host country, and to her own family’s involvement in settlement, agriculture, industry, and military service as enterprises that are far more complex than any slogan or advertisement can acclaim. © 2018 Louise Levergneux. 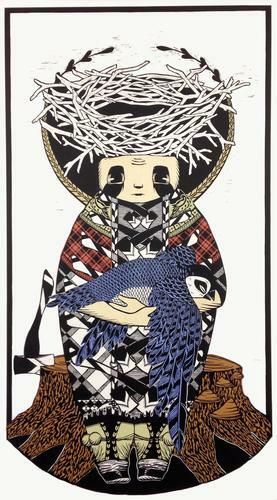 Ericka Walker, lithograph and screen print. © 2018 Ericka Walker, lithograph and screen print. As I roamed the hallways the exhibition Language of Flowers engaged my eye. 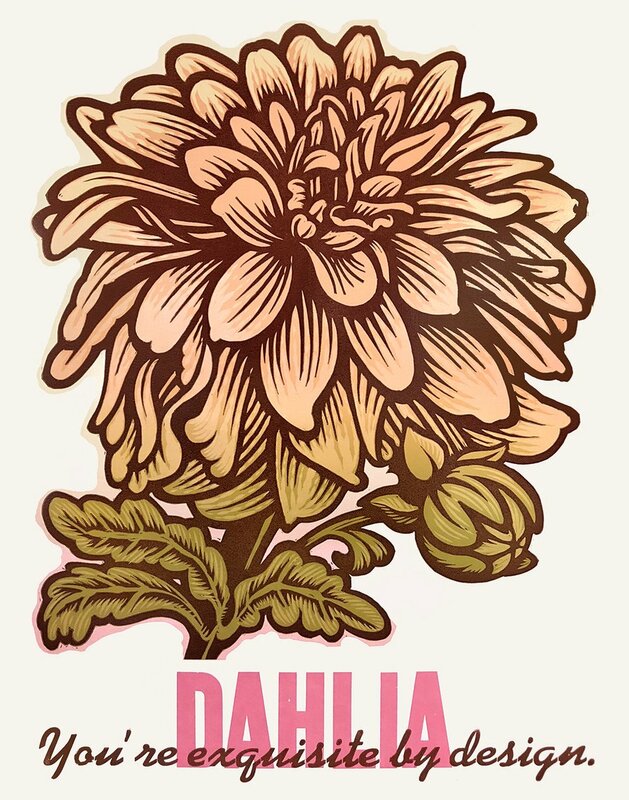 This show presents Brooklyn based, West Virginia native, Martin Mazorra’s botanical woodcut and letterpress prints that maintain the Victorian tradition of the language of flowers. Historically, flowers were a means to send coded messages that were otherwise unspoken in public. Specific flowers communicated distinct postures or sentiments. In Mazorra’s Language of Flowers, the choices of particular flowers or bouquets, along with provocative text are a contemporary interpretation to this tradition of cautious exchange. © 2018 Louise Levergneux. Martin Mazorra, woodcut with movable type. © 2018 Martin Mazorra, woodcut with movable type. Martin Mazorra is a Brooklyn based artist originally from West Virginia. He works chiefly in the medium of woodcut and letterpress, in a range of scales from small books, prints on paper, and on canvas, to site specific print-based installations. Whenever you can, join me in visiting exhibition in your area. Papers, papers and more papers! What variety of papers do you resort to for your printing job — artists’ books, prints, photography? Do you own an inkjet printer, a laser printer or a letterpress? These questions are often asked by other artists or blog readers on the substrate I use to produce my artists’ books. I find papers tactile and love their different textures, whether smooth, rough, lightweight or thick. It's a pleasure to receive a visual signal of the tactile experience a paper communicates. When I first started producing artists' books, finding papers that would impart the meaning of my publications demanded lots of research. In the end, the potential of papers designed for inkjet printers offered my books their clear, precise, vivid colours, and the contemporary look I enjoy. Generations Quad (10 mil-260 gsm) was the first inkjet paper I purchased. This is a lustre photographic paper that produces a consistent image with instant dry-time allowing prints to be handled immediately without fingerprints or scuffing. It’s available in different sizes, 13 x 19 inches works well for my template in which I print images of manhole covers for my on-going project City Shields. I can still purchase it after 18 years. I have used Aspen paper for many book projects, as in the insert for City Shields, the pages for Equinox, 26NOV2006, and Ambivalence. Unfortunately Aspen paper is no longer available. Moab Papers by Legion Papers continue to be some of my favourites. Moab produces fine art, photographic, and specialty papers. Each paper is explained in detail on their website. Moab offers free downloadable profiles for your printer and for each and every paper they sell. Utilizing their profiles will deliver the most satisfactory results. Legion Papers offers a selection of papers by its application, category, or by name. The Legion Papers website presents the opportunity to select the perfect paper for the proper printing job by responding to a few questions. After conversations with contacts at Moab Papers, Lasal Photo Matte, a double-sided paper which prints with sharp and vivid images, and Entrada Rag a 100% cotton fine art paper were wonderful finds. Entrada Rag is archival acid, and lignin-free with superb handling and sharpness. It also has an expanded colour gamut, natural contrast, and high ink load. It is compatible with both dye and pigment inks. I chose Entrada Rag for Perception, Guadalupe, and the flags of my flag-book Faux-pas. A Day Filled with Onomatopoeias was printed on Kodak Bright White Matte Inkjet Paper. This paper can be purchased from Office Depot, and produces crisp text, vivid colours and is designed for use with most inkjet printers. It can also be used with laser printers. It was ideal for the comic book look I was focused on creating.colours and is designed for use with most inkjet printers. It can also be used with laser printers. It was ideal for the comic book look I was focused on creating. Presently, I use primarily Lasal Photo Matte Paper from Moab for my books. It has given me outstanding results for Shadow Me, Finding Home, Conversation, Xtraction, Traverse, and Entre deux. If you're looking for the ideal paper for limited edition books where the prints encounter frequent handling, Lasal Photo is for you. I order Moab and Inkpress papers from ITSupplies in Meadows, Illinois and order the Generations Quad from Ink2Image in Glenview, Illinois. Try these papers and have fun with the results! Let me know what you think. Before leaving Salt Lake City, I printed all the pages and the cover of my book Shadow Me. I was having so much fun I continued to print the pages and images for Finding Home. The books are ready to cut, fold, and assemble. It is difficult to keep a working schedule on the road. First, I don’t have much space and often the everyday activities take precedence. That’s life when it interferes with art! Last week, at the Book Arts Program Studio of the Marriott Library, I met with Emily Tipps, Program Manager, and Marnie Powers-Torrey, Head of the Book Arts Program and Managing Director of the Red Butte Press. I had the pleasure of seeing some of Emily and Marnie's artists’ books, produced during the last few years. They also demonstrated some of the books produced by the Red Butte Press. The conversation continued by sharing thoughts on structures and techniques chosen, favourite binding methods, typestyle and fine press. The type of substrate of various books was stimulating as I’m constantly looking to print on new papers. 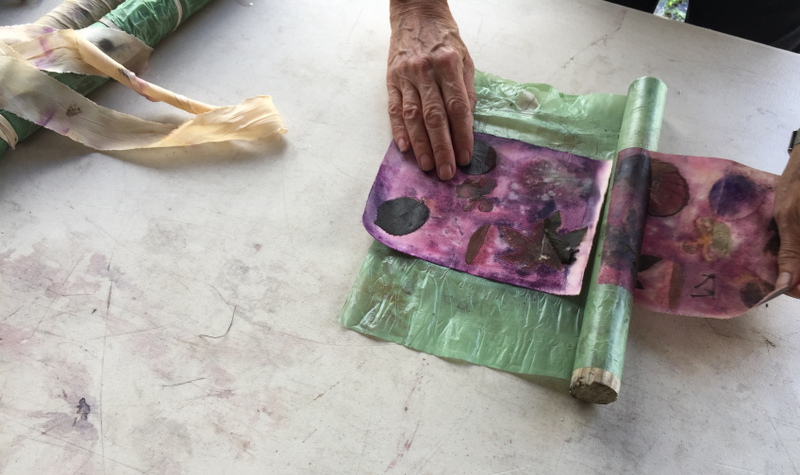 The feel of paper for the fourth imprint of the Book Arts Program (In)visible Shores by Danielle Dubrasky was very tactile, sensual to the touch. BAP imprints are designed, printed, and bound in-house. Marnie shared three of her own artists’ books. It was delightful to see Marnie enjoying the feeling of renewal through production. Mama Self is an edition of 32, the age of the artist when she became pregnant and gave birth to her second child, realizing that she'd never be the same again. Work on this book began in 2006 in a workshop with the brilliant Julie Leonard, just after the birth of the artist's third and last child. After nine years of gestation, the book was finally released into the world. Imagery is derived from circular ink washes suggesting the cyclical nature of being, the constancy of motion, revolving planets, ripe ovum and lactating breasts. The text is experimental and broken, collected in haste throughout the early years of motherhood. Stripped of formality and exposing raw, maternal femininity, the words string together a visual poem of primal and authentic language. A short exposure with Marnie Powers-Torrey by KUEDCHANNEL7. "The visual book, as I like to call it, can be a mode of creative expression." Emily Tipps is the founder of High5 Press. At the moment Emily has a new visual book in production with the working title of Amoral. I enjoyed the visual aspect, design, and composition of its pages. I aim to provoke energetic reader interaction with innovative texts, using letterpress printing, hand paper-making, and bookbinding to create limited-editions whose content and form are conceptually and interestingly related. Says Emily. The most enjoyable part of traveling is meeting old friends and artists. I’m looking forward to having a space to create and express myself through these travels. Visiting artists and getting to know the productions behind the studios are absolutely invigorating! I welcome the next encounter. My holiday back home has come to an end. It's difficult to say goodbye but time to leave and find a more temperate climate for the winter. Our small trailer is not four seasons and not suited for the coldest season of the year in Ottawa. Before leaving Canada, I wanted to pay a visit to Marlene MacCallum’s studio in the south-west part of Ontario. Marlene and her husband, David Morrish prepared a wonderful meal before taking the time to show us their studio still being built by David. After we visited the different rooms that comprise the full working area in their new home, Marlene brought some of her wonderful artists’ books for me to view and handle. What a privilege! © 2017 Louise Levergneux, Marlene and David share this room where all the digital and printing is done, the red cover protects a really big printer, NICE! © 2017 Louise Levergneux, David showing drawers of many typesets while Marlene talks about her artists' book "Nine Elevated Views". You can view this book on my post dated May 21st. Marlene uses photogravure, a historical photo/intaglio process that dates from 1879. Marlene’s chosen media plays a large role both in the way it translates the subject and in the effect of the presentation. The interaction of ink and paper with its tactile and physical presence bring to mind a state of photographic memory which can be felt in Marlene’s books and subjects. The visual interpretation of personal domestic space and the ordinary stuff of daily life has been the consistent pursuit of my practice. I am fascinated by our relationship with the spaces that frame and objects that fill the majority of daily lives, and yet, are overlooked as we move through our daily routines in a state of inattentional blindness. I begin by making photographic records. A visual occurrence that startles me out of my routine relationship with objects and spaces prompts the image choice. The gathering of images results in a visual archive of the ephemeral moments linked by a sense of the uncanny or a spatial déjà vu. Drawing on this source, I then build suites of prints or artist’s books that offer the viewer a sense of the strangely familiar. The artist’s book affords me the opportunity to integrate a variety of printing methodologies and sequential structures in a form that provides the viewer with intimate interaction with the work. 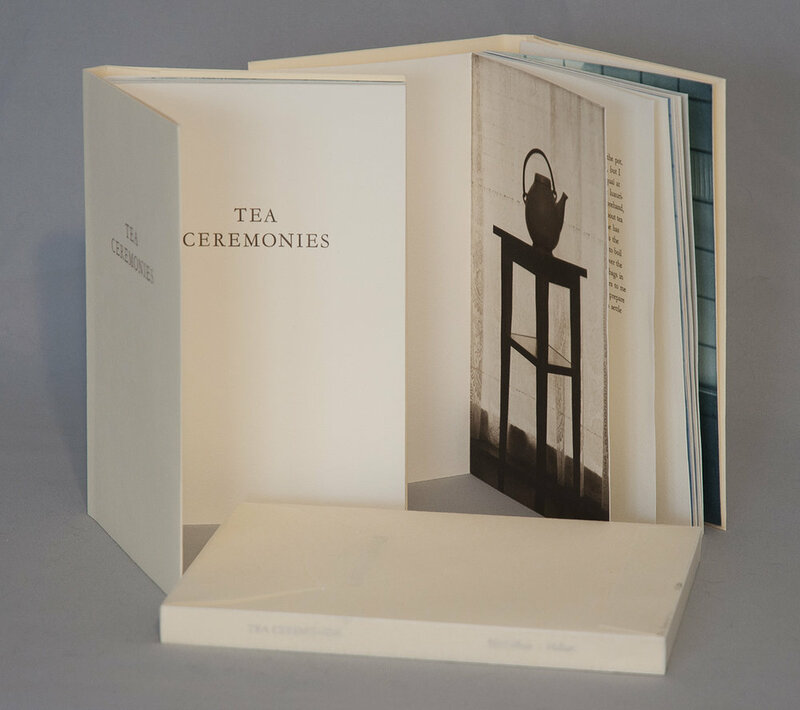 Tea Ceremonies is a collaboration with Newfoundland artist and writer, Matthew Hollett. The piece began with Matthew’s text and I created an image response and designed the book layout and structure. This work celebrates everyday rituals and small ceremonies. The piece explores repetition and sequence in its use of layered text paralleling the way everyday activities leave residue. Text, photogravure images and lithographic tea stains interact in counterpoint throughout the sequence of the book. residue. 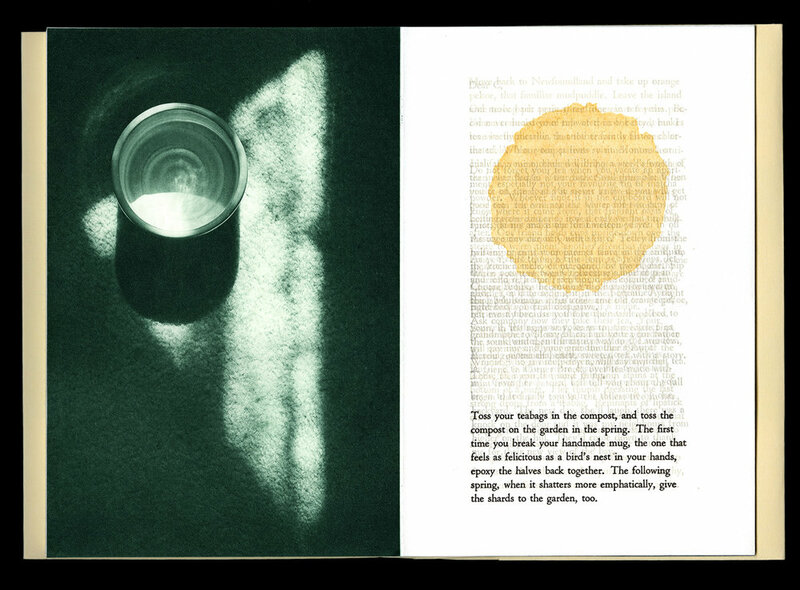 Text, photogravure images and lithographic tea stains interact in counterpoint throughout the sequence of the book. Wall Stories is a collaboration with Newfoundland writer Jessica Grant. This piece brings a different perspective to my examination of everyday spaces. Jessica’s text, The Great Indoors, and my Townsite home images interact to create a celebration of interior life with special attention to the collection of objects and the adornment of surfaces. Elements of the external world are miniaturized and nested within living spaces inverting the inside out logic of homes. The first iteration of this collaboration was published by the Journal of Artists’ Books as part of the artists’ project Switching Places. Theme and Permutation is one of a series of artist’s books inspired by the experience of living in Corner Brook’s Townsite area on the west coast of the island of Newfoundland. Between 1924-34 the pulp mill built 150 homes to house the mill management and skilled or to highly renovated. This project gave me the rare opportunity to record the evolution of interior aspects of these homes. It has been the context to explore the paradoxical phenomena of conformity and individualization that occurs in a company town. Having grown up in a suburban housing development, my earliest memories of home is that of living in a space that is reminiscent of my neighbors’. Each artist’s book explores a distinct facet of image memory, multiplicity, sequence and offers the viewer a visual equivalence of the uncanny. Theme and Permutation is a response to the permutations and variations of the type-4 Townsite House. Digital tools were used to translate the original film source of eight different window images from five houses. The sixteen offset lithographic plates were custom printed in twenty-nine separate press runs. Each image is the result of a different combination of plates. The structure is a sewn pamphlet with translucent covers. The viewer enters the body of the book with a tritone image of a single Townsite window. As one moves into the piece, new window images appear and layer over each other. The images become darker and more heavily layered towards the mid-point. The center spread has an inkjet layer of two text blocks printed over the offset litho images. The text speaks of the history of the homes, the architectural permutations and economic shifts within the Townsite area. The ensuing pages continue to provide new combinations of window layers, gradually lightening in tonality and allowing the individual windows to become more distinct. A third text block provides a personal narrative. The piece concludes with a tritone image of one of the Townsite windows in original condition. I don’t have time or space to create these days being on the road, but this time in my life is wonderful, I enjoy meeting and reading first-hand amazing works by artists’ bookmakers around the country. I will be in Austin, Texas for most of the month of November. If you know about my new my journey and would like to introduce me to your work. Let me know, I would love to visit your studio ! I’ve met with the executive director and the program director of Ming Studios to prepare for my residency starting February 6th. MING Studios is an international contemporary art center and residency program in Boise, Idaho. The gallery brings international artists to Idaho and introduces new opportunities for regional artists. Ming serves the community by hosting innovative programs including workshops and cultural activities, performances, screenings, readings and artist talks. Keeping active between meetings and emails, I’ve verified files, edited text, printed and cut the last eleven volumes of City Shields. Through the conversations, the scope of the exhibition has changed. 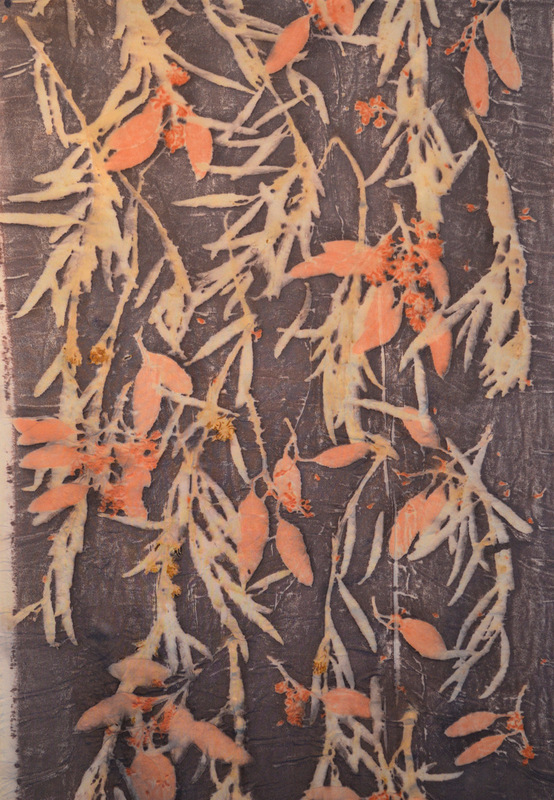 Subsequently, we wanted the viewers to capture the nature of artists’ books. The spotlight is no longer on City Shields but the idea behind my work. I appreciate simple moments characterizing our lives, building our history, whether sensational or monotonous. Fascinated by memory and identity, the day-to-day events entertain me. I want to familiarize the readers with mundane activities that link us together to regain our childhood innocence. Autobiographical references are characteristic of my work, which centers on the act of collecting and storing my memories, my self-identity, and my environment. I study my surroundings with camera in hand and accumulate memories. My process of investigation continues as I manipulate images in Photoshop and iMovie, re-organize, write and plan my artists’ books. I finish a book when my conceptual framework reads as a physical object. A digital method of reproduction gives my books a contemporary look. I work with different binding structures that respond to the book in question. The final product is a limited edition book representing the mundane in a unique, imaginative, and dynamic way for the reader to experience. This video is my interpretation of the game Decision of the Flower: She loves me, she loves me not, originally Effeuiller la marguerite. I present this game in the French style making the potential outcomes more numerous. "Il/Elle aime un peu, beaucoup, passionnément, à la folie, pas du tout" (translates to "He/She loves me a little, a lot, passionately, madly, not at all"). I created four small flip books that demonstrate these outcomes: m'aime pas du tout (loves me not), m'aime un peu (loves me a little), m'aime (loves me), and m'aime à la folie (loves me madly). The exhibition represents how I collect, document and archive using my complex, French Canadian culture.